On December 19, hundreds of San Jose State University graduates crossed the stage at the Event Center at SJSU to accept their degrees. Among those celebrating, a young woman in her cap and gown sat, quiet and contemplative, on the cold cement. 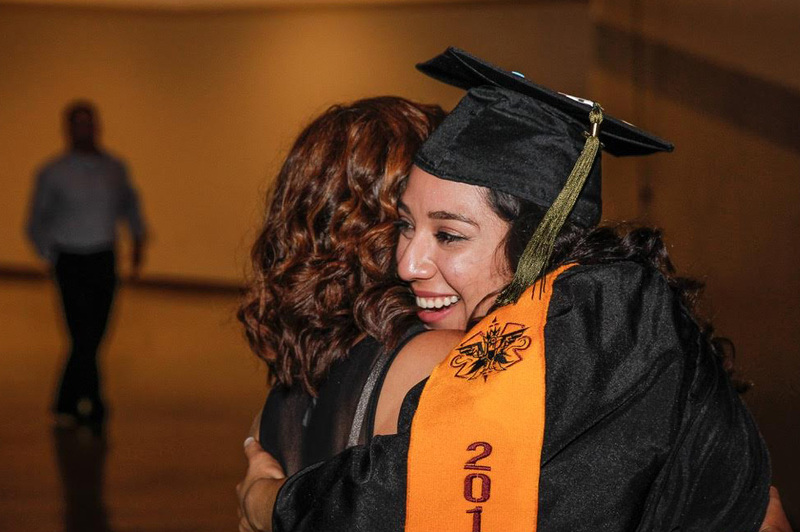 The Mercury News photographer Randy Vazquez, ’15 Journalism, tweeted a photograph of Tania Soto, ’18 Child and Adolescent Development, that included the phrase she’d written across her cap: “They Migrated So I Graduated.” The tweet quickly went viral, begging the question: Who is Tania Soto and what is the story of her cap? Soto says that her cap is dedicated to her parents, who crossed the U.S.-Mexico border to provide a better life for her and her brother. 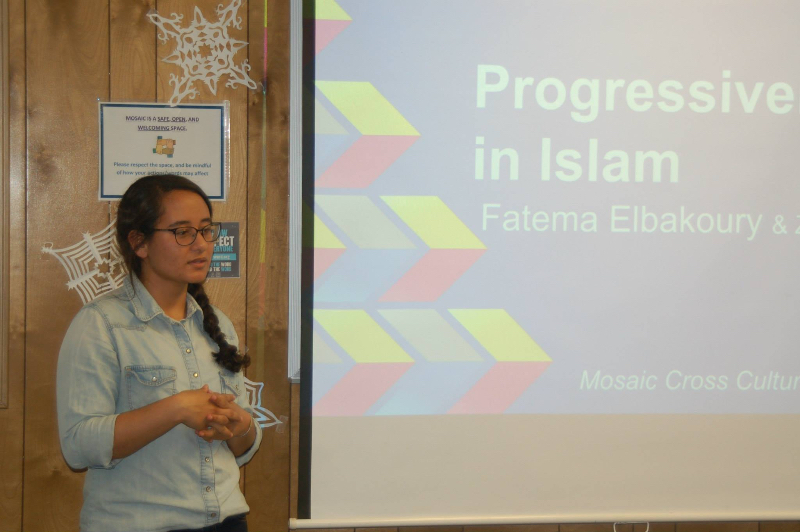 When she was in third grade, her father confided that he’d only been able to attend school through second grade—her mother through third—because he had to help support his family. 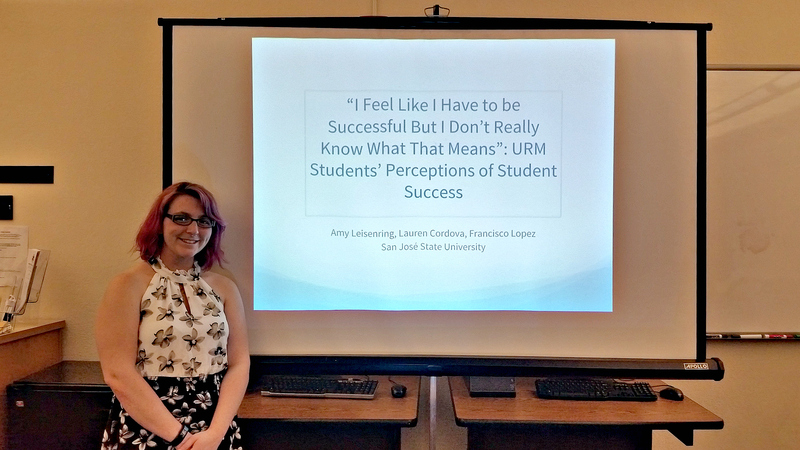 Motivated by her parents’ sacrifices, Soto resolved to pursue a college degree and create the life her family envisioned for her. “While her husband and mother were there to celebrate her achievement, Soto was heartbroken to learn that her father couldn’t get off work. She says that crossing the stage, accepting her diploma and shaking President Mary Papazian’s hand was her father’s moment as much as it was hers. Still, she savored the experience. When she spotted Vazquez’s tweet, Soto was surprised and humbled by its response. Her belief in the impact of education is echoed in her work at an infant toddler center in Palo Alto. 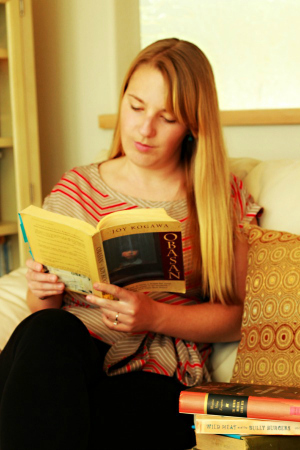 She plans to use her experience, coupled with her expertise in child development, to inspire kids to plan for college. 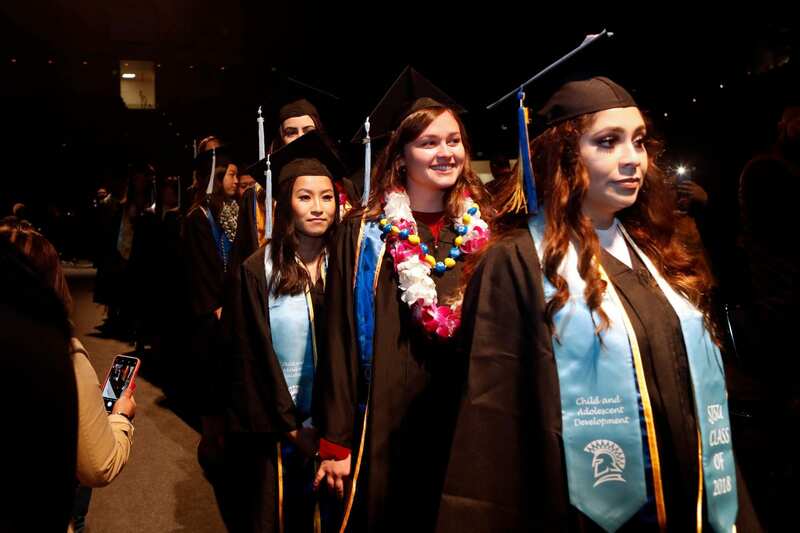 Perhaps some of Soto’s future students will one day follow in her footsteps, crossing the stage at the Event Center at SJSU, becoming Spartan graduates themselves. More than 4,000 San Jose State University students graduated in December 2018, joining a community of 270,000 Spartan alumni. As students and faculty finish final exams in the coming days, we have a momentous week ahead of us. For more than 10,000 students, commencement will mark the fulfillment of many aspirations and dreams—for themselves and their families. Our ceremonies are rooted in a deep academic tradition, but commencement is about more than the conferral of degrees. When we gather together—family and friends, faculty and staff, and community members—we are celebrating the transformation that these students have undergone during their time at San Jose State University. I hope all of you will join me in acknowledging the tremendous achievement of these students who completed degrees in 2017-18 by offering well wishes as they begin a new chapter in their lives. Next year, we anticipate holding both fall and spring commencements to allow all students and families to celebrate in the moment. For more details on this year’s ceremonies, visit the commencement website. This year, we will continue with our tradition of presenting the Outstanding Graduating Senior Awards and Outstanding Graduate Thesis Award during commencement, when these students will be recognized at their college’s ceremony. The students selected to receive the Outstanding Graduating Senior Awards have shown a commitment to community service and leadership while maintaining a stellar academic record. Sierra Peace, a College of Social Sciences psychology major, arrived at San Jose State as a 16-year-old freshman with her sights set on medical school. 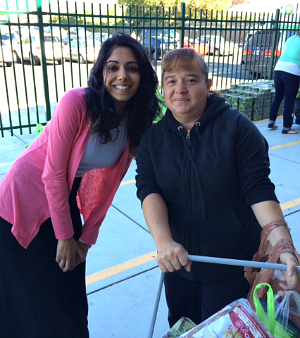 She juggled four jobs while volunteering with the Third Street Community Center, the Associated Students community garden and Regional Medical Center of San Jose. Her 3.97 GPA qualified her for Educational Opportunity Program Honors for four years. In the College of Applied Sciences and Arts, Department of Health Science and Recreation’s Nardos Darkera has given back to the Spartan community while maintaining a 3.85 GPA. 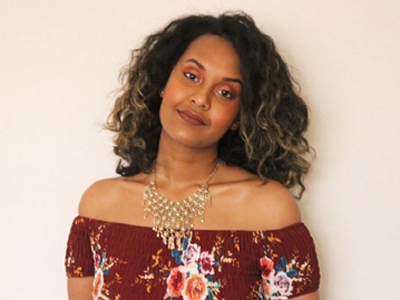 As a public health student, she has represented San Jose State as a United Nations Foundation Global Health Fellow, served as a peer teaching assistant, and worked as a lead peer advisor in the College of Applied Sciences and Arts Student Success Center. I am also pleased to recognize the exemplary research of a top student this year. A graduate student in the Department of Environmental Studies in the College of Social Sciences, Emily Moffitt collected feathers from more than 160 birds at the San Jose Coyote Creek field station. She analyzed the specimens to understand where the birds spent their breeding seasons, providing important information about migrations that could prove critical for preserving habitat. 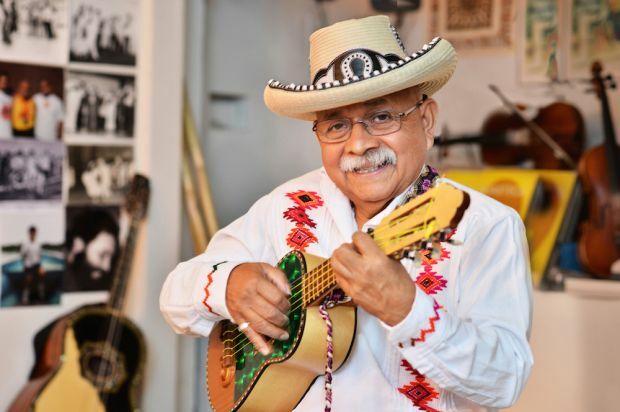 I also am looking forward to welcoming Artemio Posadas, an educator of traditional Mexican music and dance, at the College of Humanities and Arts ceremony. Posadas, our 2018 honorary doctorate of Humane Letters recipient, was a 2016 National Endowment for the Arts National Heritage Fellow. He was born in San Luis Potosí, Mexico, where he discovered son huasteco, regional music, punctuated with poetic, instrumental and dance improvisation and falsetto breaks. The NEA posted excerpts of two lively numbers. A tremendous influence for generations, Posadas has taught musicians and dancers for 40 years. Read more about his achievements online. The tradition of the mace derives from medieval times in England, when it was held by a guard for dignitaries at ceremonial functions, and maces remain in use today by governing bodies worldwide. The carrying of the mace will add an extra air of dignity and authenticity to our commencement. Yvonne Escalante, ’13 MFA Spatial Arts, considered elements of our own university history when she set out to design and create the new ceremonial mace. Her philosophy as a craftswoman and SJSU Art and Art History lecturer also helped to shape the meaning of this new piece of SJSU history. Read more about Escalante’s process in designing the mace on the WSQ Magazine Blog. 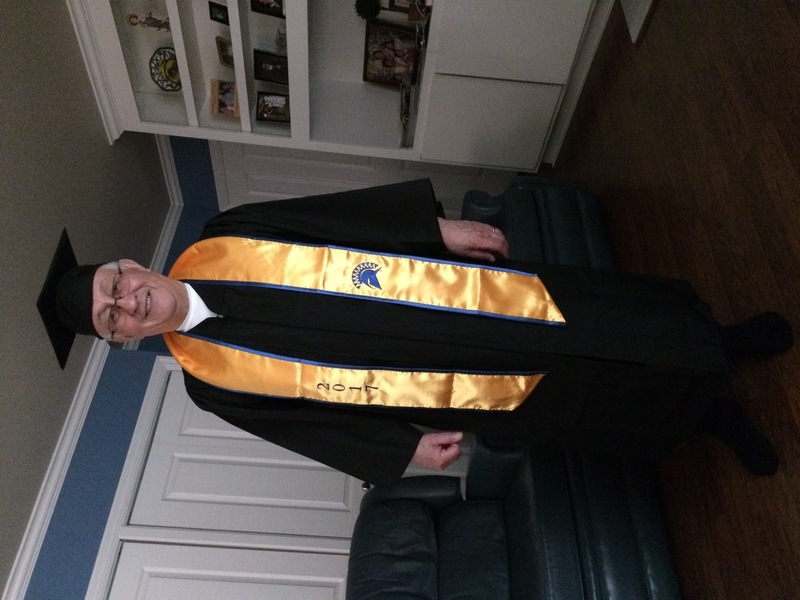 An enormous number of faculty and staff members, along with alumni and retirees, led by Commencement Committee chair Brian Bates, have been working together quite literally to re-write the script for how San Jose State honors its graduates. I would like to express my heartfelt gratitude to everyone who has contributed to this effort and who will continue to work on stage and behind the scenes through all seven ceremonies this week. Your willingness to move mountains for San Jose State is an attribute of this university community that I have come to appreciate deeply. 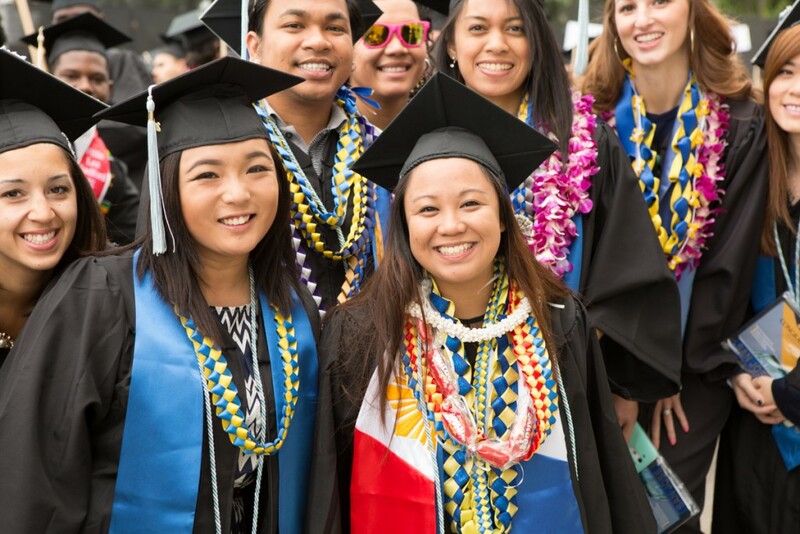 SAN JOSE, CA – San Jose State University President Mary A. Papazian will recognize this year’s top graduates at commencement ceremonies to be held May 23-25 at the SJSU Event Center and Avaya Stadium. Nardos Darkera and Sierra Peace will each receive the 2018 Outstanding Graduating Senior Award for academic achievements, leadership roles, contributions to the community and personal achievements. 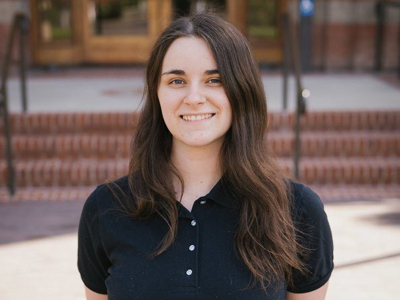 Emily Moffitt is the recipient of the 2018 Outstanding Thesis Award in recognition of the quality of her research. 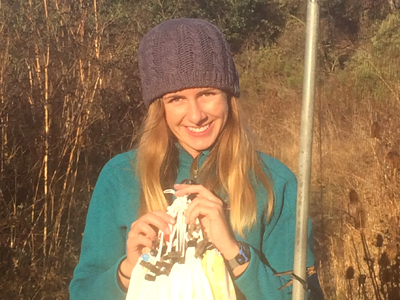 Emily Moffitt, ’17 Environmental Studies, collected feathers from 169 birds at San Jose’s Coyote Creek Field Station, and then analyzed the feathers for stable isotopes to reveal where birds spent their breeding season. Her thesis “Using Stable Isotope Analysis to Infer Breeding Latitude and Migratory Timing of Juvenile Pacific-Slope Flycatchers (Empidonax difficilis)” revealed the species’ migratory patterns, critical information for preserving habitats the birds need to survive. 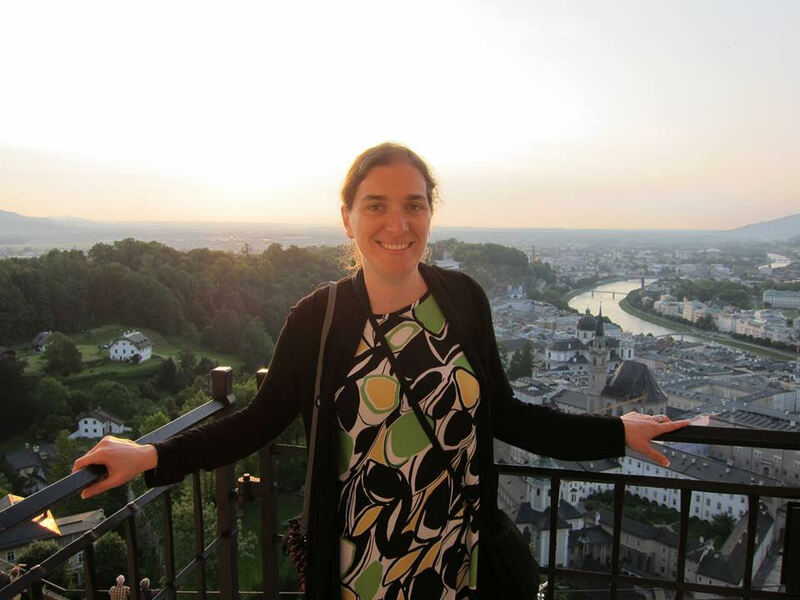 She partnered with the University of California, Davis, Stable Isotope Facility to develop statistical programs and used ArcGIS to portray probable breeding origins, and support her research using isotope reference and Breeding Bird Survey data. 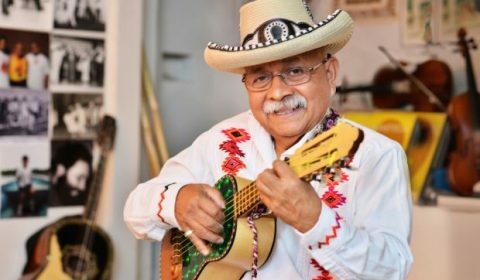 SAN JOSE, CA – San Jose State University announced today that Artemio Posadas, a celebrated educator of traditional Mexican music and dance, will receive an honorary Doctorate of Humane Letters during the College of Humanities and the Arts commencement ceremony beginning at 1:30 p.m. May 24 at the Event Center at SJSU. Posadas was a 2016 National Endowment for the Arts National Heritage Fellow. He was born in San Luis Potosí, Mexico, where he discovered son huasteco, regional music punctuated with poetic, instrumental and dance improvisation and falsetto breaks. The NEA posted excerpts of two lively numbers. A graduate of the Universidad de San Luis Potosí, Posadas recorded regional sones with the late Beno Liberman for the Antología del Son Mexicano. In 1974, he started giving music and dance workshops in California, where he later became an American citizen. Since 1991, he has been teaching the youth at the East Bay Center for the Performing Arts in Richmond, Calif.
Posadas served as a master artist through the Alliance for California Traditional Artists, and taught at the Center for Training and Careers in San Jose and in the East Bay public school system. A tremendous influence for generations, Posadas has taught musicians and dancers for 40 years. San Jose State University concluded the year with its largest graduating class ever and a speaker who encouraged the Class of 2017 to “stand up for truth and reason” in a fast-paced and changing world. Nearly 10,000 students received degrees this year. Among all those diplomas were 3,000 master’s degrees and 27 doctoral degrees, including the first graduating class of a new doctoral program in educational leadership. Family members and guests arrived as early as 7:30 a.m. May 27 to find optimal seats to see graduates on the floor of CEFCU Stadium, Home of the Spartans. The morning fog burned off just in time for President Papazian to address the graduates on the football field. A ceremony highlight: the hooding of eight new doctors of education focusing specifically on educational leadership, earned while many of the new Ph.D.s worked full time. Their goal? To grow in their careers while serving their communities as leaders of primary and secondary schools, as well as colleges and universities. The graduates pursued dissertations on such varied topics as project-based learning and closing the achievement gap, harkening back to the university’s roots as a teacher’s college, founded in San Francisco shortly after the Gold Rush. 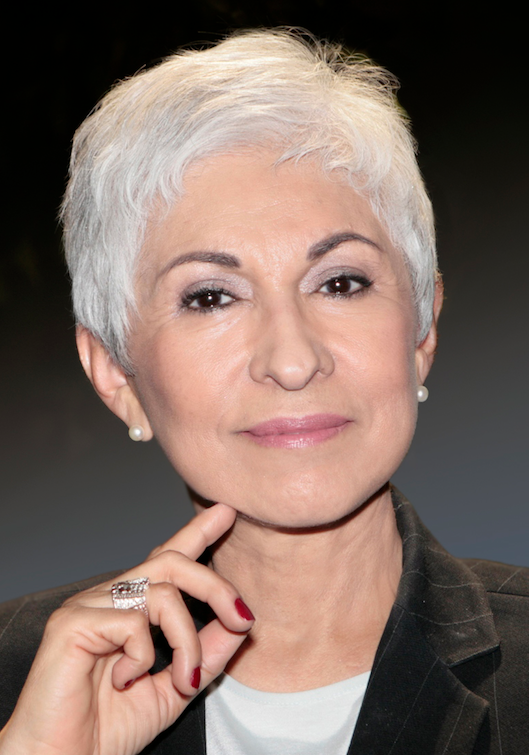 Award-winning television journalist and CEO of Latinas Contra Cancer Ysabel Duron, ’70 Journalism, delivered the Commencement address, appealing to the graduates to recognize that their degrees empower them to use their voices and contribute to society. She brought a clock and a typewriter with her to the podium, pointing out that despite changes in technology, the values of a university endure. A pioneering Latina broadcast journalist, Duron covered regional, national and international events for 43 years, culminating in two decades as a Bay Area reporter and anchor before launching an encore career as founder of Latinas Contra Cancer. During the ceremony, Phil Boyce, ’66 Business Administration, received an honorary doctorate of humane letters. Boyce has dedicated his career as a banker, businessman and philanthropist to cultivating healthy communities. As chairman of the board of the Valley Foundation, Boyce helped establish a simulation nursing lab and create an endowment to support what is now known as the Valley Foundation School of Nursing. Following the speeches, the dean for each of San Jose State’s colleges took to the podium to confer master’s and bachelor’s degrees upon the graduates. As the ceremony finished, SJSU’s newest alumni joined in singing the alma mater while guests cheered. Perhaps the proudest moment for the thousands of graduates in attendance came at the end, as they gathered with family and friends on the field for hugs, tears and, of course, photos. See and share photos and messages from commencement with #SJSU17 on Facebook, Twitter and Instagram. 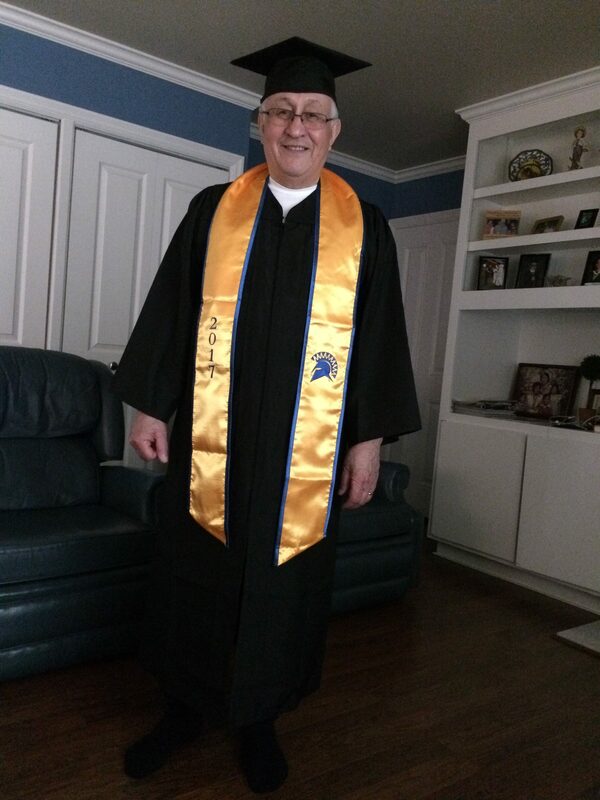 SAN JOSE, CA – San Jose State University announced today that business leader and philanthropist Phillip R. Boyce, ’66 Business Administration, will receive an honorary Doctorate of Humane Letters at Commencement. The ceremony is scheduled to begin at 9:30 a.m. May 27 at CEFCU Stadium, Home of the Spartans. The event will be streamed live on the university’s website. “Through a decades-long commitment to giving back, alumnus Phillip R. Boyce epitomizes Spartan pride. In recognition of his outstanding accomplishments and dedication, the California State University Board of Trustees and San Jose State University are proud to confer upon him the honorary degree of Doctor of Humane Letters,” President Mary A. Papazian said. Boyce founded Pacific Valley Bank, serving Santa Clara, Santa Cruz and Monterey counties, in 1975. Under his leadership as chairman and CEO, the bank grew to $1.4 billion in assets. He served as chairman and CEO of Pacific Western Bancshares, the bank’s holding company, as it evolved into Western Capital Management and eventually merged with Comerica. He has served as president of Boyce Associates since his retirement in 1994. A 1997 recipient of San Jose State’s Tower Award and distinguished alumnus from SJSU’s Lucas College and Graduate School of Business, Boyce has devoted his career to investing in and cultivating healthy communities. 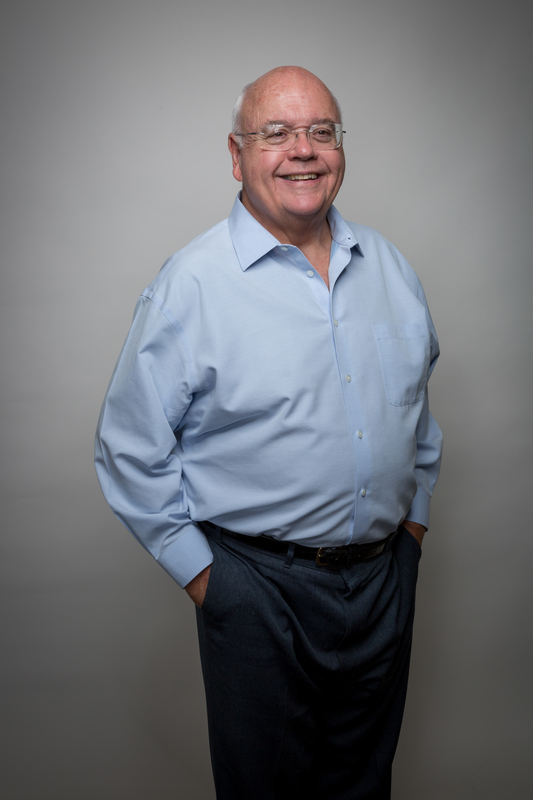 As chairman of the board of the Valley Foundation, he helped establish a simulation nursing lab at SJSU’s School of Nursing and created an endowment to support the school, now known as the Valley Foundation School of Nursing. Boyce has served in leadership capacities for dozens of Silicon Valley causes, including the Montalvo Center for the Arts, the Technology Center of Silicon Valley, the Community Foundation of Santa Clara County, the Hakone Foundation, the Silicon Valley Children’s Fund, and the Heritage Bank, among others. He currently serves as director of Goodwill Industries International, Inc. When Elizabeth López learned that her uncle Jesse Musquez, ’73 Math, had completed his degree but never walked in Commencement, she asked why. As an undergraduate graduation evaluator at San Jose State’s Office of the Registrar, she knew how important it is for college students to celebrate their graduation. Back in 1973, Musquez was a young father of two, with a third on the way. As a Vietnam veteran, Musquez had already overcome significant obstacles in pursuing his education. 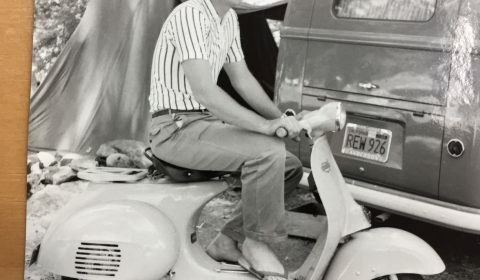 When he was a young child, his family had worked for the automotive industry in Michigan before moving out west to pick apricots, cotton and grapes in the Valley of Heart’s Delight. 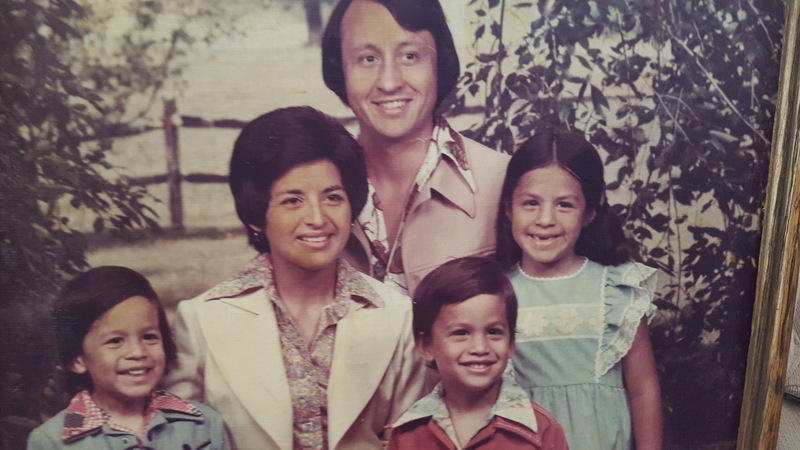 The Musquez family in the 1970s. From left to right, Christopher Daniel, Maria, Jesse, Marcos and Anna (all photos courtesy of the Musquez family). Determined to be the first in his family to complete a college degree, Musquez put himself through school on the G.I. Bill and worked full-time to support his wife and children. Just as he was completing the final requirements for graduation, his sister-in-law passed away unexpectedly, leaving three small children. 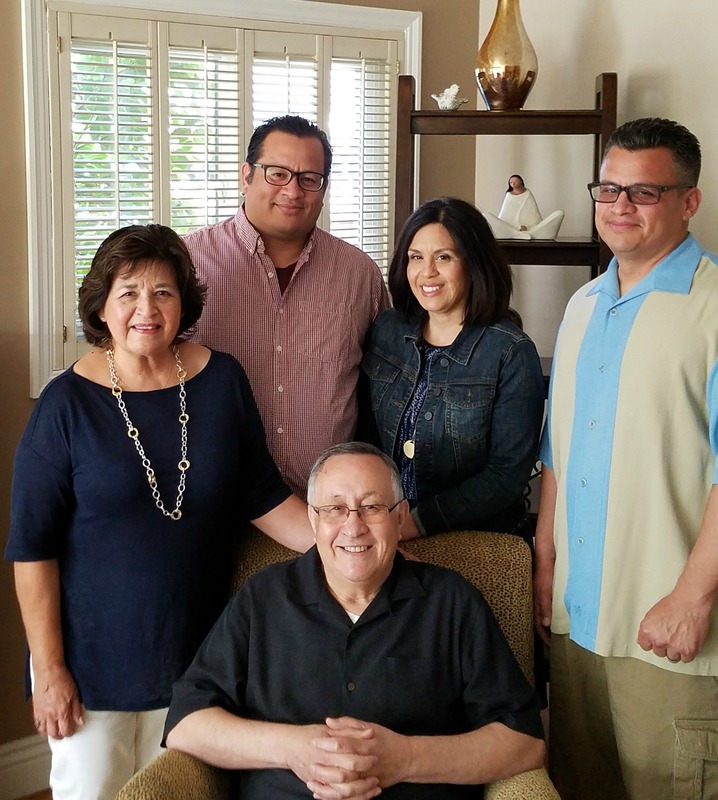 Instead of donning his cap and gown, Musquez, along with his wife and his in-laws, focused on providing care for their family—a consistent theme throughout his life. When she heard this story, López felt moved to do something. She investigated what it would take to bring her uncle to CEFCU Stadium on May 27 in cap and gown. “My father is a fantastic example of someone who came from very simple means and has accomplished so much. He is an example of the American dream,” said Musquez’s daughter Anna Martorana, ’99 Molecular Biology. Musquez, age 73, had originally pursued math as a pathway to coding, though at the time that he graduated, there weren’t any jobs in the field. Instead he chose a career in electronics, working for several years for Fairchild Semiconductor before entering international sales. “For being someone who picked cotton and worked in the fields to graduating from San Jose State, it’s been a long journey,” Musquez said. Throughout his successful career, the focus has always been on family. It’s no surprise that he’ll be surrounded by 15 family members on the big day, many of them flying in from out of town. Jesse Musquez in cap and gown. When he went to pick up his cap and gown, surrounded by graduates of the Class of 2017, he says the excitement was palpable. 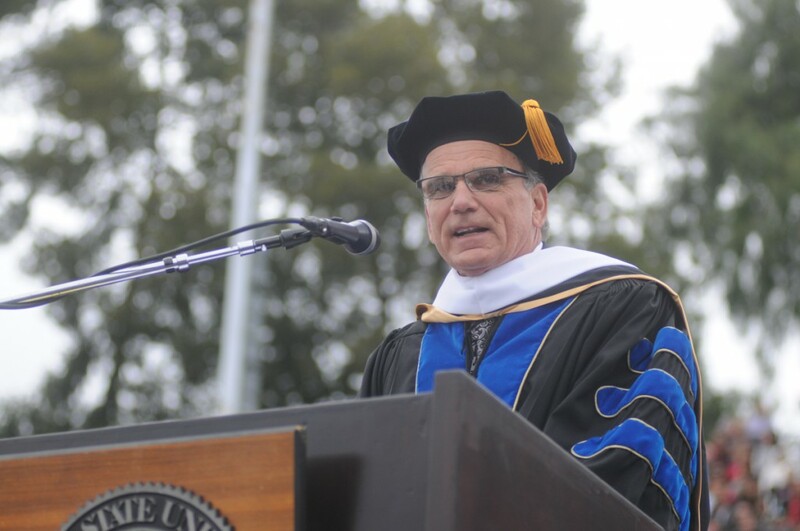 SAN JOSE, CA – San Jose State University concluded the year with its largest graduating class ever and a commencement speaker who pulled no punches while telling SJSU’s newest alumni that the fate of the nation rests on their shoulders. More than 9,000 students received degrees this year, including approximately 2,000 engineering majors, 1,000 business majors, and thousands more majors in the arts and sciences. They will enter the working world or begin coursework toward advanced degrees as colleges and universities nationwide continue to address campus unrest over race relations, equity and safety. 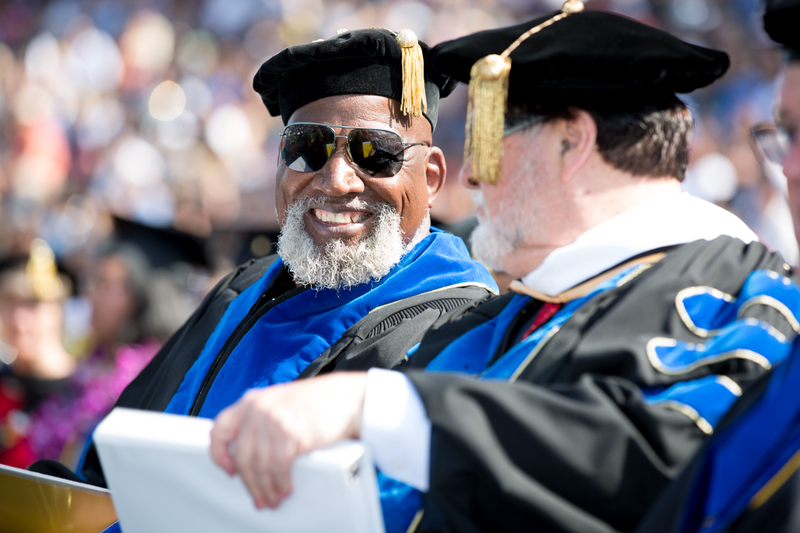 There was perhaps no better time for alumnus Harry Edwards to return to serve as the commencement speaker on May 28 in Spartan Stadium. It was his first major address at SJSU since leaving campus in a cloud of controversy a half century ago. Born and raised in the Midwest, Edwards came to California to attend college, arriving during the middle of the civil rights movement. He finished his degree, and then began a doctoral program at Cornell University while teaching at SJSU. It was then that he became nationally known as the outspoken leader for the Olympic Project for Human Rights, which exposed the inequities experienced by black athletes representing the nation abroad while fettered by racism at home. Edwards was a major influence on Tommie Smith and John Carlos, SJSU students and track and field stars who medaled at the 1968 Olympics. They leveraged their moment in the spotlight to take a stand for human rights, then were expelled from the Games and admonished by many, angered by the politicization of the international event. Once known as a dangerous militant, this year’s commencement speaker is now recognized for his role in the civil rights movement. Perhaps the most poignant moment of commencement came when Edwards rose to receive an honorary Doctorate of Humane Letters from the California State University. CSU Trustee Steven Stepanek bestowed the honor, assisted by John York, co-chair of the San Francisco 49ers. York and Edwards appeared together, a rare glimpse into the personal nature of the relationship between the professor and the team. In addition to serving as a teacher, author and father, Edwards carves out time to work with the 49ers, something he began back when desegregation of professional sports was fresh and new. His role has been to help coaches and players from very different backgrounds work and grow together. He was especially close to the late Bill Walsh, the 49ers coach and fellow SJSU alumnus who took the team to three Super Bowls in the 1980s. A note from Walsh to Edwards is among the items in a new collection at the Dr. Martin Luther King, Jr. Library. The video and prepared remarks from today’s speech are available online. But his thoughts were rooted in the complex academic theories he spent a lifetime studying, discussing and practicing, especially what it means to live in a participatory democracy. In these ways, he addressed the question on everyone’s mind — what can today’s activists learn from those of yesteryear? — while encouraging youths to confront and prevail over the greatest challenges of our time. Edwards’ deep voice thundered through Spartan Stadium, midway through a ceremony steeped in tradition. Top graduates were recognized, beloved professors honored, a moment of silence held in memory of classmates who passed away. One tradition that takes on extra meaning at SJSU is the moment when the president invites all the graduates to stand and thank family and friends for their support over the years. Given that more than half of the graduates are the first in their families to earn college degrees, this never fails to bring forth sustained applause from the graduates on the field, and tears from their loved ones in the stands. Of course there comes a point at any commencement when the graduates can’t hold back any longer, and today was no different. Once again, exuberance erupted as degrees were conferred, tassels moved from left to right, and beach balls appeared. See and share photos and messages from commencement with #SJSU16 on Facebook, Twitter and Instagram. The founding campus of the 23-campus California State University system, San Jose State provides a comprehensive university education, granting bachelor’s, master’s and doctoral degrees in 145 areas of study with an additional 108 concentrations – offered through its eight colleges. 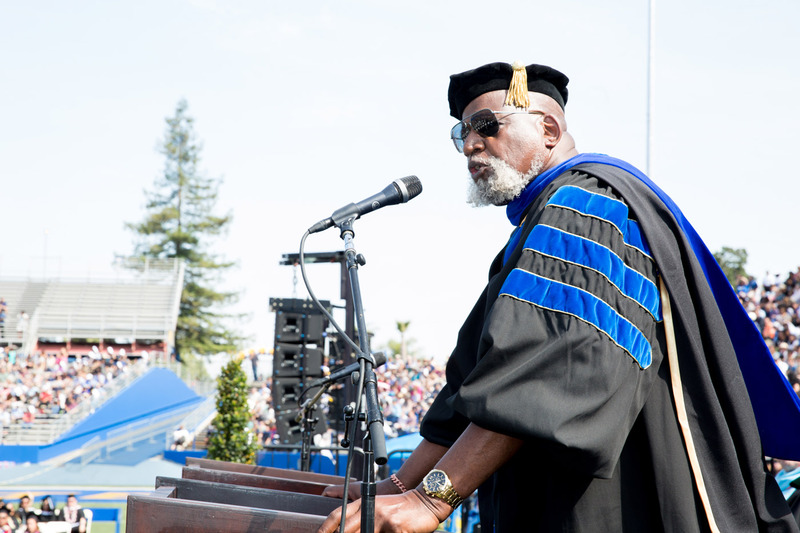 SAN JOSE, CA – San Jose State University announced today that human and civil rights icon Harry Edwards, ’64 Sociology, will serve as its 2016 Commencement speaker. In addition, Edwards will receive an honorary Doctorate of Humane Letters at Commencement. The ceremony is scheduled to begin at 9:30 a.m. May 28 at Spartan Stadium. The event will be streamed live on the university’s website. 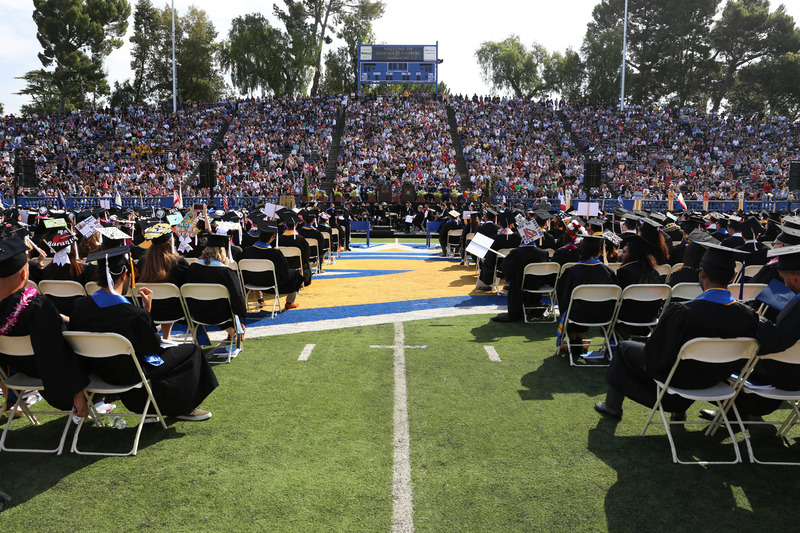 This academic year, an estimated 9,000 San Jose State students will earn bachelor’s, master’s and doctoral degrees. Approximately 15,000 family members and friends are expected to attend Commencement. Harry Edwards, 73, was born in St. Louis, Mo., and raised in East St. Louis, Ill., the second of eight children. With no more than a third-grade education, his father supported the family and encouraged Harry to take advantage of the opportunities the sports world provided. Edwards followed through, excelling in sports and academics in high school. With financial support from a St. Louis-area attorney, he arrived in California to attend Fresno City College on a track and basketball scholarship. He later transferred to San Jose State University, where he served as captain of the basketball team and set school records for the discus. Edwards set SJSU records for the discus (courtesy of Spartan Athletics). After graduating in 1964 with a degree in sociology, Edwards had three choices: professional football, professional basketball, or graduate school. He chose graduate school, and began work on master’s and doctoral degrees at Cornell University in New York. 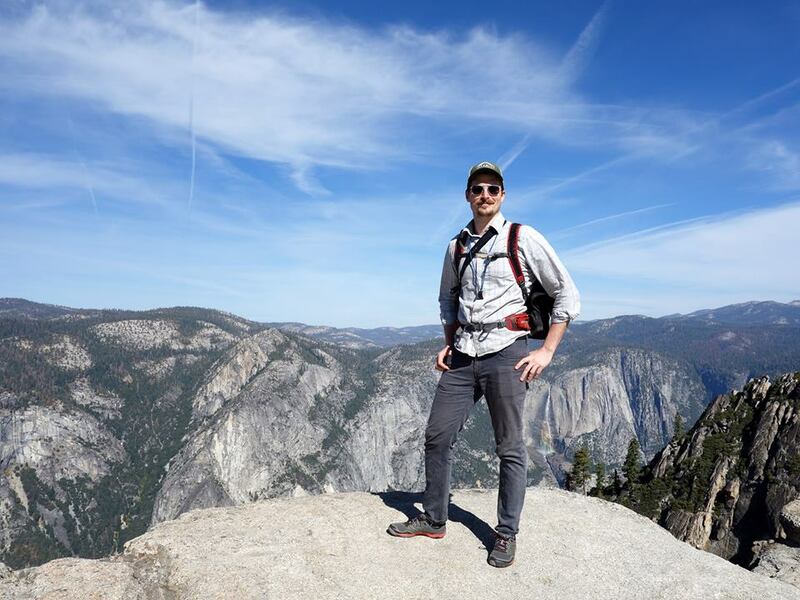 After completing his master’s degree, he took a break from his studies to return to San Jose State, where he worked as a part-time instructor of sociology. The year was 1966, and the civil rights movement was in full swing. Drawing on his childhood experiences, his years as a college athlete, his academic training, and his desire to educate, Edwards began gaining national attention for speaking out on the inequities he perceived in the nation and the sports world. “During the 1967 college football season, Edwards, then a part-time instructor… presented a list of civil rights grievances to the administration on behalf of the school’s black students, particularly its athletes. Edwards’s group threatened to ‘physically interfere’ with the opening game if demands were not met. It was a regional watershed in radical sports activism, and the mainstream reaction was also a first; the opening game was canceled,” according to The New York Times. The following year brought the assassinations of Dr. Martin Luther King, Jr., and U.S. Senator Robert Kennedy. 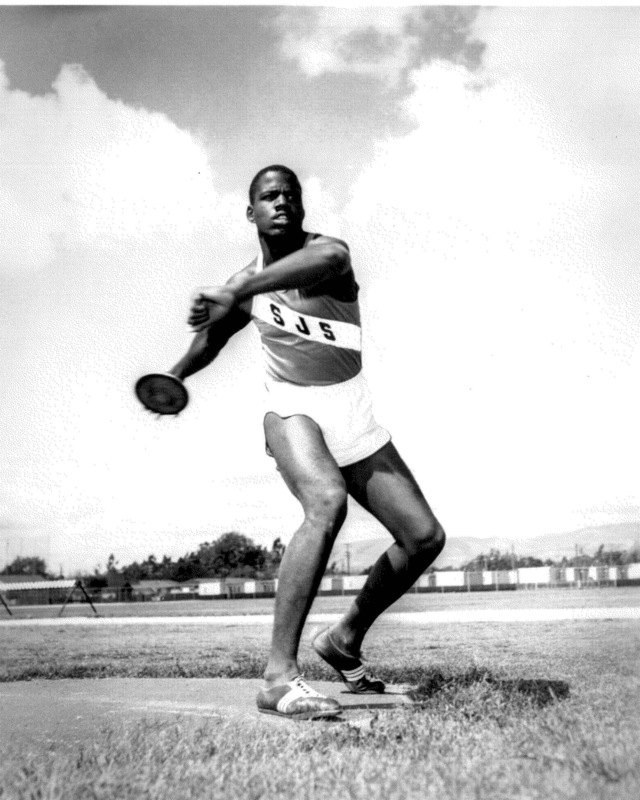 Edwards lent his voice and support to the Olympic Project for Human Rights, a movement calling upon black athletes to boycott the 1968 Olympics in Mexico City. Watching television in the United States, Edwards observed SJSU track stars and U.S. Olympians Tommie Smith and John Carlos take a stand for human rights on the awards podium. 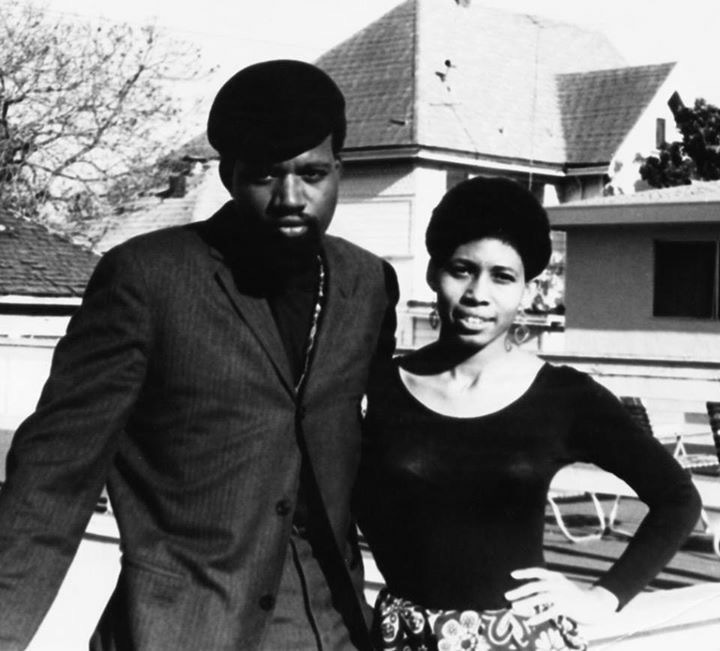 Harry Edwards and Sandra Boze Edwards met at SJSU (courtesy of Mr. Edwards). At the time, all three men were heavily criticized for their actions. Three decades later, San Jose State student leaders recognized the courage of these Spartans by memorializing the moment with a 24-foot tall sculpture in the heart of our campus. Edwards went on to earn a doctoral degree from Cornell University in 1971, and to begin a distinguished, three-decade career as a professor of sociology at the University of California, Berkeley. A giant of a man with a caring presence, his “Sociology of Sports” course was among the most popular on campus. During that time, he remained in constant contact with the professional sports world, where he served as a consultant to two luminaries who also graduated from San Jose State: Major League Baseball commissioner Peter Ueberroth, ’59 Business, and the late San Francisco 49ers Head Coach Bill Walsh, ’55 BA, ’58 MA Education. In addition, Edwards worked with the Golden State Warriors and the University of Florida. In all of these roles, he sought to develop practices and programs to increase minority representation in the coaching ranks and to support players of color as they navigated the opportunities and pressures of college and professional sports. Edwards delivered a moving eulogy for Walsh, summarizing the ways they sought to provide opportunities to all NFL players. 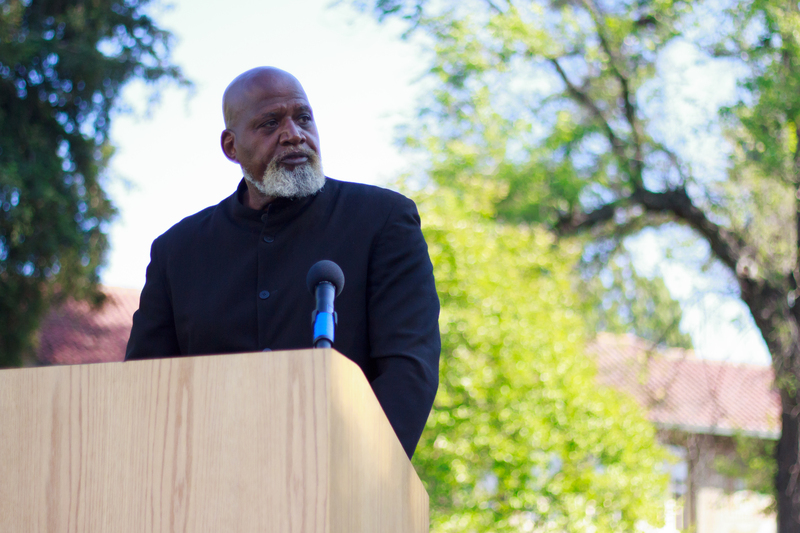 Harry Edwards is the author of four books: “The Struggle That Must Be,” “Sociology of Sports,” “Black Students,” and “The Revolt of the Black Athlete.” He has been married for 47 years to Sandra Boze Edwards, ’70 BA Liberal Studies, ’88 MA Education. The couple resides in Fremont, Calif., and they are the parents of three now adult children: a lawyer, a physician, and an information technology/computer programming specialist. 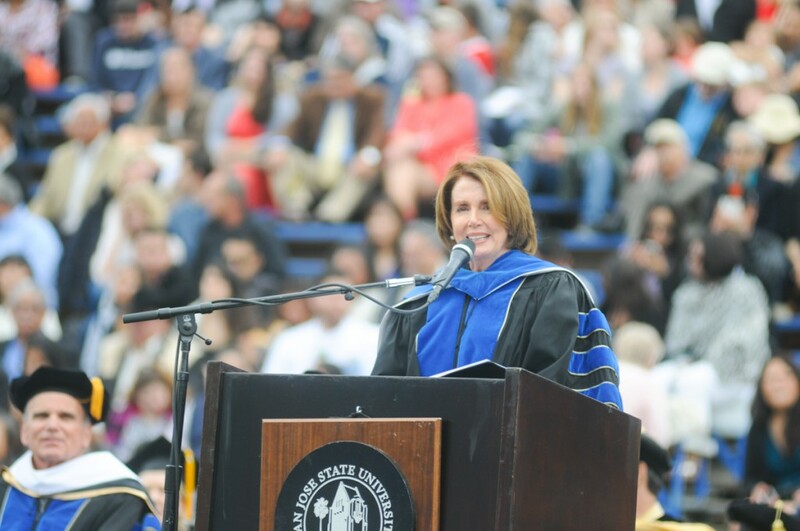 San Jose State University graduates received congratulations and advice on being prepared for the circuitous route life often takes from U.S. House of Representative Leader Nancy Pelosi and honorary degree recipient Bob Ladouceur at Commencement May 23 in Spartan Stadium. 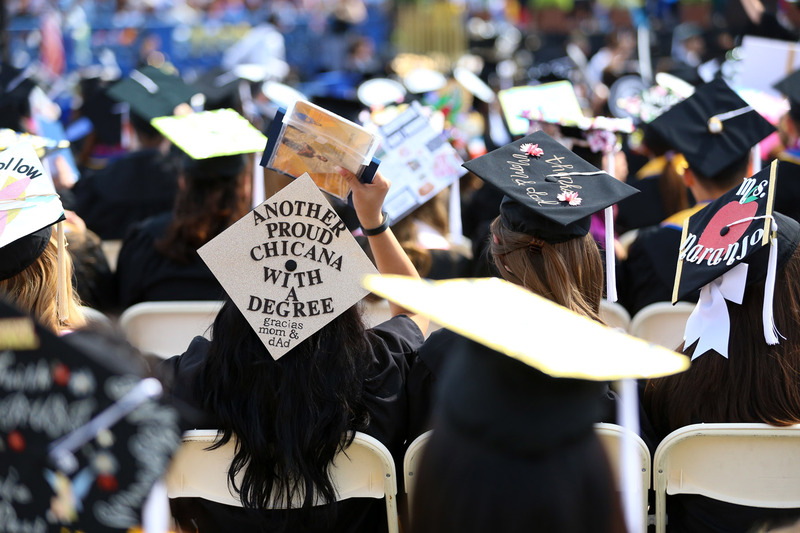 The Saturday event celebrated this year’s more than 8,500 students who earned bachelor’s, master’s and doctoral degrees in a wide range of disciplines from seven colleges at SJSU. Family members and guests arrived as early as 7:30 a.m. to find an optimal seat to see graduates on the stadium floor. Occasional bubbles floated up from the stadium on the cool morning breeze as guests waited for the ceremony to start. One mother waited along the edge of the stands and dropped an orchid lei down to her child as the graduates processed into the stadium. Many graduates donned decorated caps acknowledging the hard work to complete their degrees, while others emphasized their future plans. 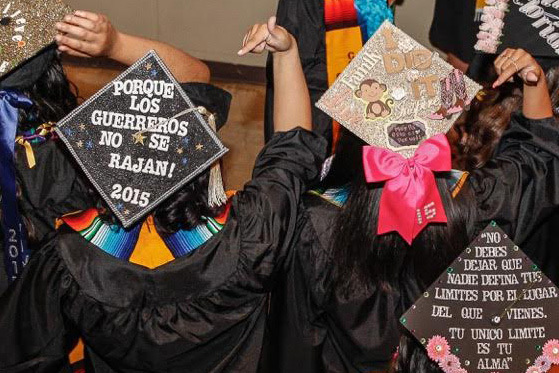 Others decorated their caps to evoke solidarity with their classmates—a swath of students from the College of Humanities and the Arts sat together with the same design on their caps. 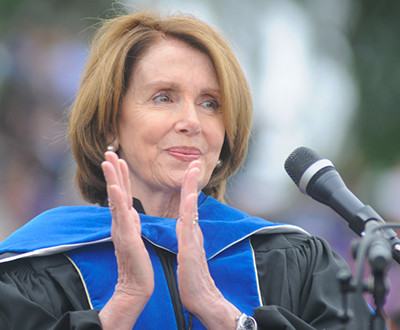 Pelosi congratulated the students on joining the CSU Class of 3 Million. The 23-campus system has conferred degrees to 1 in 20 college graduates in the United States, with the alumni roster growing to three million with the class of 2015 graduates. “Nancy Pelosi is the perfect candidate to speak to us today because she embodies the grit and determination that make us Spartans,” Qayoumi said, introducing Pelosi. In her remarks, Pelosi touched on the beauty of diversity at SJSU. She also reflected on San Jose State’s influence on its surrounding community. Pelosi shared a personal story of how she consulted her youngest child, a high school senior, before running for Congress. Pelosi ran and has represented California’s 12th House district for more than 27 years. During the ceremony, President Qayoumi conferred an honorary doctorate of humane letters to Bob Ladouceur, ’77 Criminal Justice, whose astounding 12-season, 151-game winning streak coaching football at De La Salle High School is the subject of the movie, When the Game Stands Tall. Ladouceur, who played on the Spartan football team for two years as a student, shared how his journey to becoming a legendary football coach was indirect. Ladouceur credited his education at SJSU with making him a lifelong learner who has always sought the truth. Following the speeches, the deans each took the podium to confer the master’s and bachelor’s degrees upon the graduates. As the ceremony finished, the graduates joined in singing the alma mater while guests cheered. 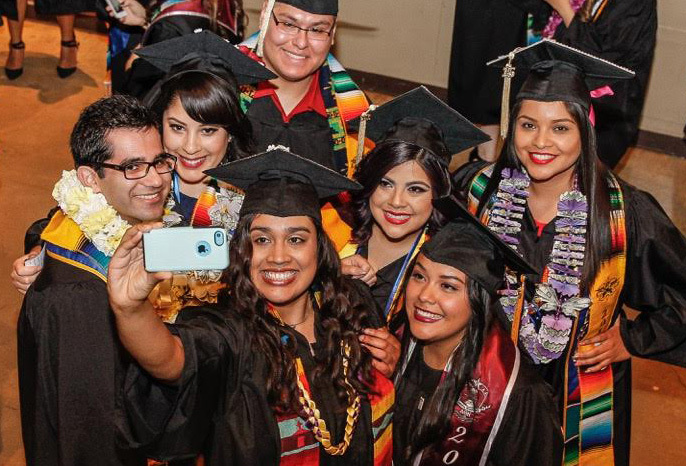 See and share photos and messages from commencement with #SJSU15 on Facebook, Twitter and Instagram. 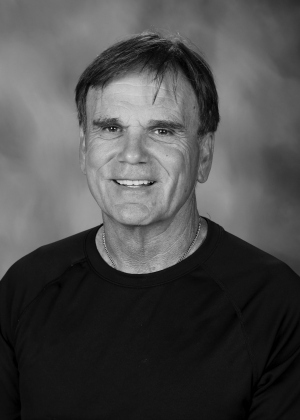 SAN JOSE, CA – San Jose State University announced today that educator and former De La Salle High School head football coach Bob Ladouceur, ’77 Criminal Justice, will receive an honorary Doctorate of Humane Letters at Commencement. The ceremony is scheduled to begin at 9:30 a.m. May 23 at Spartan Stadium. This academic year, more than 8,700 San Jose State students will earn bachelor’s, master’s and doctoral degrees in a wide range of fields, from business, engineering and nursing to humanities and the arts. Approximately 15,000 family members and friends are expected to attend. Bob Ladouceur’s astounding 12-season, 151-game winning streak at De La Salle is the subject of the movie, When the Game Stands Tall. His career began at SJSU, where he played Spartan football for two seasons. He went on to work as a juvenile hall counselor while studying theology at St. Mary’s College, where he earned a master’s degree. Ladouceur discovered his calling when his friend, fellow SJSU alumnus and high school football coach Rob Stockberger, invited him to one of his games. In 1979, Ladouceur was hired as a teacher and head football coach at De La Salle High School in Concord, Calif. At that time, the school had never had a winning season. 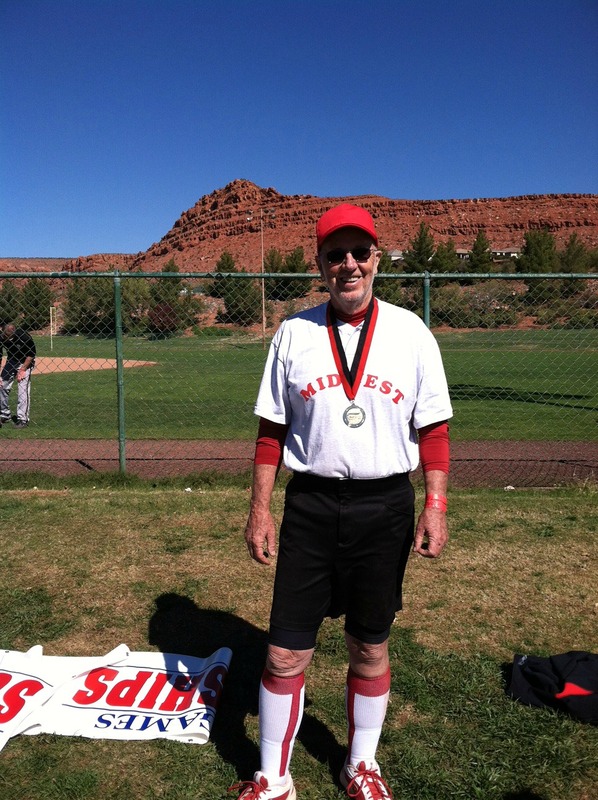 During his 34-year tenure, the team never had a losing season again; the team earned the most victories in state history. Ladouceur has received many awards as a teacher and coach. He has been inducted into the SJSU Spartan Sports Hall of Fame and the Bay Area Sports Hall of Fame. Just a touch of rain greeted 30,000 Spartans heading to campus for the first week of spring term 2015. This includes 500 new transfer students and 450 new graduate students making the transition to SJSU. It’s time to dream big, with everyone is settling into new classes in hopes of earning good grades. Check out the new student success centers and growing Student Academic Success Services staff, along with Ask Me tables across campus. Of course friends can help, too. Many of our over 400 student organizations are recruiting new members outdoors this week. The discussion continues on how to help San Jose State become an even more welcoming community. Famed Princeton Professor Cornel West, author of “Race Matters,” will speak at April 9. You might remember him from “The Matrix” movies. Spring term ends with Honors Convocation and Commencement. Finally, all that hard work pays off for more than 7,000 new grads. Does this include you? Claim your place in history and enter a drawing for a $10,000 scholarship for you or someone of your choice. List your profile on the CSU Class of 3 Million yearbook. This major milestone signifies the huge influence our alumni have in shaping California. 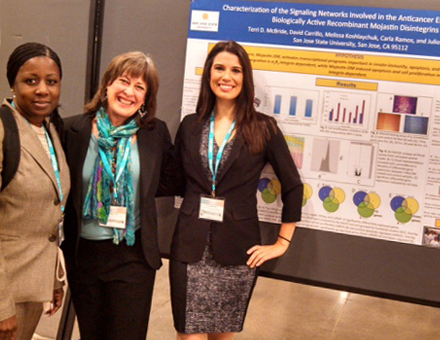 It’s true SJSU students and alumni are excelling every day in many ways. There are lots of reasons to be a proud Spartan! Posted May 24, 2014 by the San Jose Mercury News. Some of the biggest lessons that electrical engineer Donald Flowers II, learned at school happened outside the classroom. Discipline. Time management. Financial budgeting. Focus. 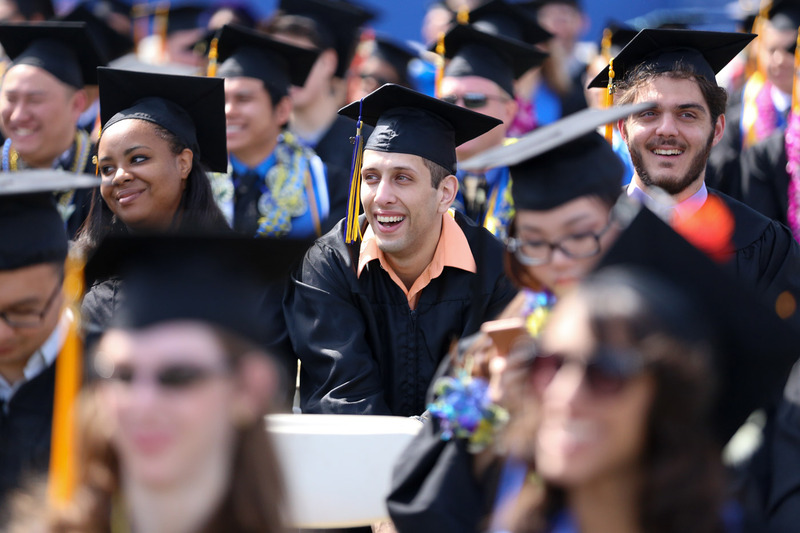 “You cannot give up,” said the 34-year-old Flowers, one of several thousand ebullient San Jose State students celebrating their Saturday graduation in Spartan Stadium’s bright morning sun. Flowers reflects the kind of success the university has made its mission: offering working students — many of them older or immigrants and transfers from two-year campuses — the intellectual rigor and credentials needed to lift themselves securely into the middle class. SAN JOSE, CA – Distinguished graduates whose lives and significant achievements serve as examples to our students will be honored during Commencement, beginning at 9:30 a.m. May 24 in Spartan Stadium. More than 8,500 candidates who completed their studies in August 2013, December 2013 and May 2014 will be eligible to participate in the annual ceremony. 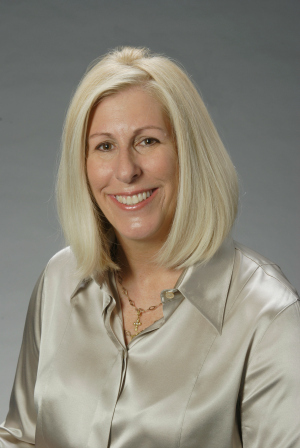 Nancy McFadden, ’84 Political Science, will serve as Commencement speaker and receive an honorary Doctorate of Laws. She worked as a senior administration official for President Clinton and two California governors. 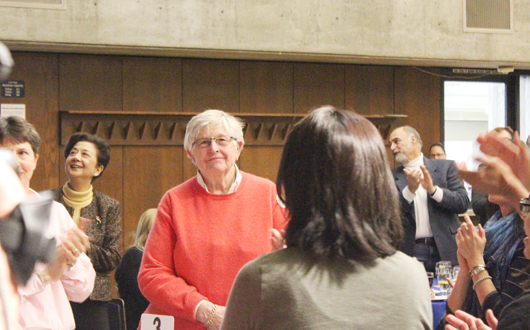 “Nancy McFadden worked hard to earn positions at the highest levels of public service, always giving back to the communities she calls home,” President Mohammad Qayoumi said. 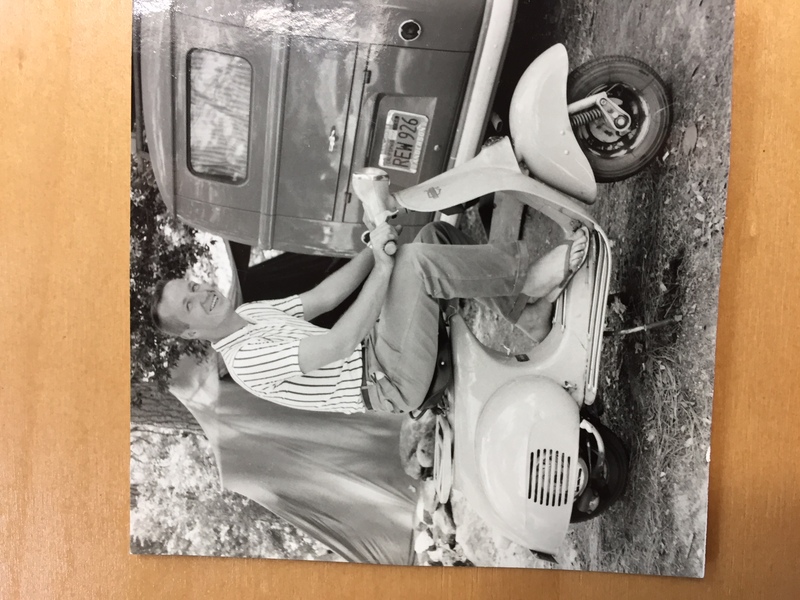 The late William Hauck, ’63 Social Science, will receive a posthumous honorary Doctorate of Laws. Hauck worked in senior positions for Governor Wilson and three Assembly speakers. “Rising from student body president to top leadership roles in Sacramento, Bill Hauck was a lifelong supporter of our students and our mission,” President Qayoumi said. 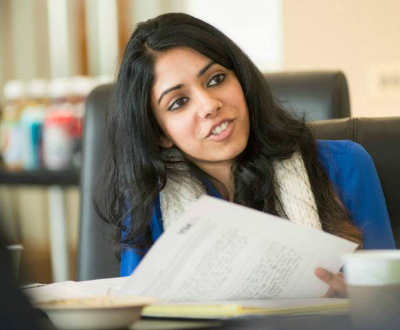 A Bay Area native, McFadden attended law school at the University of Virginia. Prior to her current appointment as executive secretary for legislation, appointments, and policy to Governor Edmund G. Brown, Jr., she held multiple executive positions within PG&E Corporation, including senior vice president and senior advisor to the chairman and CEO, and senior vice president of public affairs. McFadden spent nearly two decades serving as political and policy advisor to California Governor Gray Davis and as a senior member of the Clinton administration. She is a member of the board of trustees for The California Museum and the Fine Arts Museums of San Francisco, and serves on numerous boards for social and environmental organizations. A prominent figure in the California Capitol for decades, Hauck worked in senior positions for three Democratic Assembly speakers—Jesse Unruh, Bob Moretti and Willie Brown. He was also deputy chief of staff to Governor Pete Wilson and a trusted adviser to Governor Arnold Schwarzenegger. Hauck joined Goddard Claussen/West as senior advisor in late 2011. From 1996 to 2011, he served as president and CEO of the California Business Roundtable, a leading public policy advocacy association. 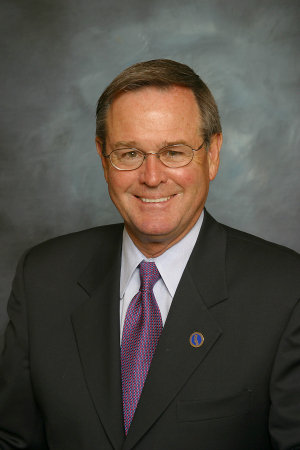 Hauck served on the board of Blue Shield of California. He also contributed generously to an annual CSU trustee scholarship that benefits San Jose State students who have overcome great obstacles. With that, President Qayoumi strode off the stage and through the crowd to hand deliver a very special honor at the 15th Annual Faculty Service Recognition and Awards Luncheon on March 11 at the Student Union’s Barrett Ballroom. Seated near the front of the room, surrounded by friends and colleagues, was Wiggsy Sivertsen. Her official record includes stints as a counselor and faculty member. But just as important has been her unofficial role as the heart and soul of San Jose State for more than four decades. Also recognized at this annual event were more than 120 faculty members with 15, 20, 25, 30, 35 and 40 years of service, as well as the recipients of the university’s top annual awards for faculty members. The luncheon is always filled with faculty and staff members and administrators. But this year, sitting quietly in chairs off to the side of the room were a half-dozen students. Carrying flowers for their professor, they talked their way in to see Distinguished Service Award Recipient Julia Curry Rodriguez. And it was there on the floor, while the proceedings continued on stage, that teacher and students quietly celebrated the connection at the core of the luncheon. 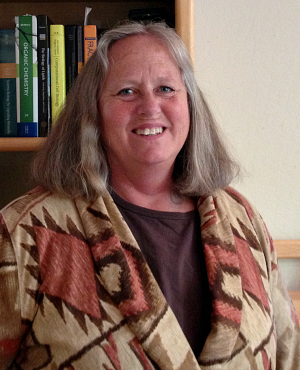 Similarly, Sivertsen dedicated her entire career to service in the classroom and beyond, focusing on educating the public about lesbian, gay, bisexual and transgender communities and fighting for the rights of all. 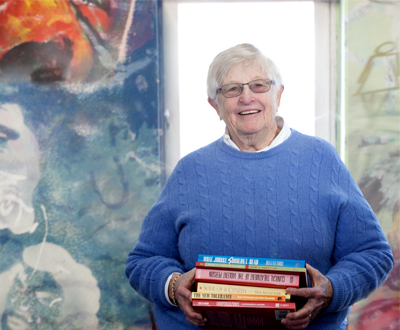 Soon after arriving at SJSU in 1968, she established the first gay student organization. She went on to co-found the Bay Area Municipal Elections Committee, a four-county LGBT political action group. In the 1980s, she taught in the sociology department and later spent 11 years as director of counseling services. Thank you for your visionary leadership and dedication to San Jose State University,” said the commendation hand-delivered by the president.